When everyone has a secret, the real mystery is knowing when to tell. Investigative reporter Charlotte McNally is an expert at keeping things confidential, but suddenly everyone has something to hide—and even Charlie realizes it's possible to know too much. Her latest television scoop—an expose of a dangerous car scam, complete with stakeouts, high-speed chases and hidden-camera footage—is ratings gold. Now, in the prime time of her journalism career, it seems like Charlie's dreams are about to come true. If she can just balance her career and her upcoming wedding—perhaps she can really have it all. But soon Charlie's personal and professional lives are put on a terrifying collision course. Her fiancé is privy to information about ugly phone calls at an elite private school, threats that are suddenly turning deadly. There's a mysterious death. And then—another. Her soon-to-be stepdaughter may be in danger. Her fiancé comes under suspicion. Then Charlie's career takes a turn she never could have predicted. "Hank Phillippi Ryan knows the television business entirely; she understands plotting; and she writes beautifully. No wonder I loved Drive Time. Anyone would." "Drive Time may be Hank Phillippi Ryan's best novel yet—a stunning and timely plot enhanced by the life-changing events in her investigative reporter's personal and professional life. A realistic and endearing portrait of a woman trying to have it all. (And if any woman can, that woman is Charlotte McNally.)" "Drive Time is Hank Phillippi Ryan at her nonstop best. I loved it! The story grabbed me on the first page and didn't let go until the very last page...and I can't wait for more Charlotte McNally. Smart, witty and no one's fool, Charlie is a heroine for today. Readers won't be able to get enough of her." **Sew Deadly was the “Fresh Fiction Pick of The Day” on freshfiction.com October 2, 2009! **Sew Deadly earned a perfect five out of five stars from Night Owl Reviews! **Sew Deadly was one of Sharon’s Top Ten Cozy Mysteries of 2009 on Freshfiction.com! 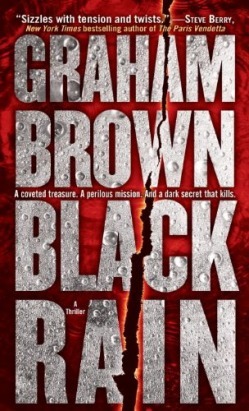 Black Rain sizzles with tension and twists that both entertain and magnetize. The plot envelopes the reader into a brilliantly conceived world, full of strange and amazing things. Graham Brown is an exciting new talent, a writer we're going to be hearing a lot from in the years ahead. I can't wait." "Black Rain is an adventure that's not only a terrific read, but is smart, intelligent, and poised to shake up the whole thriller community. Every copy should come with a bucket of popcorn and a John Williams soundtrack to play in the background. Loved it." Far from the gleaming monuments of Washington D.C., NRI operative, Danielle Laidlaw leads an expedition into the heart of the Amazon, in search of a legendary Mayan city rumored to be hidden within the tangled rain forest. Assisted by a renowned university professor and protected by an ex-CIA mercenary named Hawker, her team sets out with the truth concealed from them—that they are replacements for a group that vanished weeks before and that the treasure they’re seeking is no mere artifact, but a find that could transform the very world. Shadowed by a ruthless billionaire who wants their prize, threatened by a violent indigenous tribe and stalked by an unseen enemy that leaves only battered corpses in its wake, their one hope for survival rests in learning the truth: the connection linking the deadly reality of the Mayan legend; the nomadic tribe that haunts them; and the chilling secret buried deep beneath the ancient ruins. Winner of the prestigious Anthony Award for Best First Novel in the US. Winner of the Barry Award, voted on by readers of Mystery News and Deadly Pleasures Magazines in the US. "Grabenstein's gripping second holiday thriller [has] a spectacular finish. This rapid-fire entertainment is sure to please Grabenstein's fans." "Grabenstein weighs in with book two of his series featuring FBI agent Christopher Miller in another book filled with holiday madness. This time out Miller is on the trail of terrorists planning an explosion at JFK airport. Miller has to deal with an apathetic reaction to his information and continues the hunt on his own while at the same time trying to help his daughter cope with the aftermath of the previous Christmas (SLAY RIDE). The pacing of this book is so perfect, the suspense builds with every turning page. Ultimately timely and action heavy HELL FOR THE HOLIDAYS makes the holidays dangerous and entertaining as hell. Part Die Hard and part Criminal Minds this book will take your mind off the leftovers and erase any thoughts of napping. Grabenstein is a truly gifted writer and one I would not miss." "Saint Christopher is back—stronger and better than ever... HELL FOR THE HOLIDAYS is an exciting book that I would recommend highly. The characters seem real and Chris Miller is someone I won't tire of soon." "The Miller series is as good as his John Ceepak series. If you like plenty of action definitely pick up one of the Christopher Miller books. Any of Chris Grabenstein's books will entertain you. He's a fine new author and every time he writes another book, from either of his series, I'm ready to read it." "Mr. Grabenstein has given his growing audience a taut, fast-moving thriller, packed with suspense and a wonderful hero [dubbed "Saint Chris" by his friends and neighbors] determined to stop the impending catastrophe. Filled with suspense and scarily real 'bad guys,' Hell for the Holidays is a great read, at holiday time or any other." 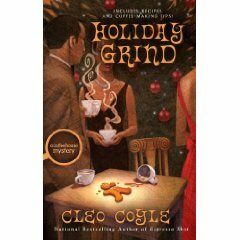 "Chris Grabenstein's Hell for the Holidays is an entertaining, page turner. It's a great kickoff to the holiday season. Grabenstein may have scared readers away from Santa Claus. Now, no one will want to travel on Thanksgiving... Grabenstein puts Miller and the terrorists on a collision course, culminating on a holiday weekend. It's a fast-paced novel that shows the power of a network that can stretch from Wyoming to Tennessee, and Wisconsin to New York. Only Grabenstein can add humor to such a scary concept. It's another topnotch thriller." What the critics said "Ann Cleeves won the Duncan Lawrie Gold Dagger for Raven Black and rightly so. It's in the tradition of the small community murder mystery, but done with a depth that infuses this genre with new realism. A young girl is murdered in the Shetlands and an elderly recluse stands accused, as the lives of a complex society become intertwined to a fascinating effect. "And that is exactly what happened with Raven Black, and I was gripped as much by the landscape and climate of Shetland as I was by the characters living in fear and suspicion along its coastline." "The village mystery has a long pedigree, but it fell into disrepute when practitioners lost touch with realism and took all their characters from stock. 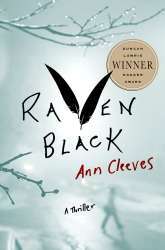 With Raven Black, Ann Cleeves shows how it can be brought up to date.